Likwid brings exactly zero innovation to the game mechanics, but their twist is a “freemium” model that gives you the game for free, but lets you buy levels of songs you already know and love. The basic game is really more like a demo. You can play through various levels designed to let you get the hang of the controls. You encounter various tools to help you twist and bend the light streams to light up all the targets. The game is silent until you light one up, and the more targets you light, the more instruments you hear, and the more complex the track becomes. The levels aren’t generally very hard, but they do require some creative thinking and occasionally a little patience. I might have been impressed if I’d never seen anything like it, but this is clearly an inferior Auditorium clone. The graphics are very Rock Band or Guitar Hero-inspired and way on the cheesy end of the spectrum. The gameplay itself isn’t too bad, but the levels take a long time to load, and the additional content seems expensive, at $.99 per song for five short levels. Plus, the store offerings are extremely limited, and very rarely would you ever be stuck on a single level long enough to listen to an entire song. The basic content is rather more comprehensive than the free versions of Auditorium or Genesis, but you’re essentially getting a longer tutorial at the expense of graphics and music. Overall, I found Likwid pretty disappointing. They took Auditorium’s sweet game mechanic and just punted the lush music and sleek design sensibility that made the game great. The overall effect just screams lousy copy. I can appreciate what they were trying to do, but, sadly, you just can’t play rock, paper, scissors with only rock. Save your money and get Auditorium instead. 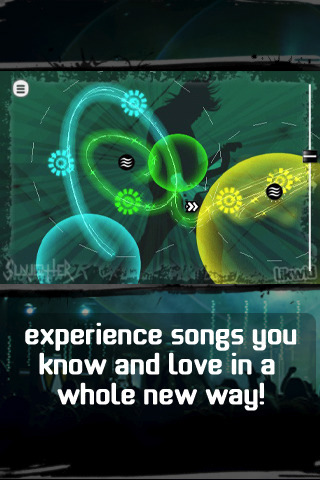 AppSafari review of Likwid was written by Tracy Yonemoto on March 29th, 2010 and categorized under App Store, Games, Music. Page viewed 2999 times, 2 so far today. Need help on using these apps? Please read the Help Page.